Clutter Robs You of Time and Effectiveness. 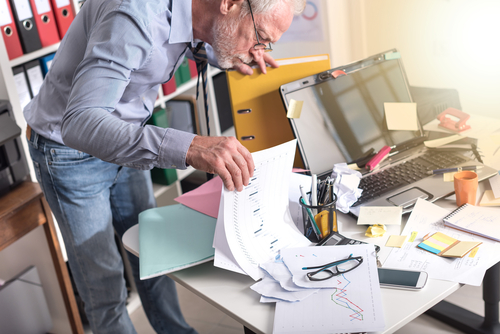 The National Association of Professional Organizers reports that paper clutter is the number-one problem for most businesses. On average, a person loses one hour of productivity each day due to such clutter. Another study shows the average worker wastes up to one week a year searching for misplaced items. The negative impact of clutter on productivity is not restricted to the US. One report indicates disorganized employees can cost managers up to 10 percent of their salary. The coming of warmer weather brings talk about spring-cleaning. The concept is old, but you can use it as a trigger to take a deep dive into to the work/life clutter that hinders your productivity. How about you? Whether working in an office or at home, you need to deal with those papers, reports, and assorted items cluttering your desk. Become more aware of how your space affects your concentration and work completion. For example, messy desks and closets, and disorganized files, contribute to an unpleasant atmosphere. However, they are more than just unpleasant, they function as distractions. Often in subtle but pervasive ways, they decrease the rate and efficiency of your performance—and increase your stress in the process. Spring, with its new beginning and refreshing feeling may provide the energy and sense of renewal to attack the worst of the clutter. For many, tackling their desk is easiest. However, beginning the task may be cumbersome. You wonder about where to start, how long to work at it, what to do with all the stuff…. Settle down and relax for a bit. Listen to sue music, have a refreshing snack or beverage, and think some positive thoughts. Visualize or take a few photos of places that have clutter. Ask, Where is the easiest place to start. For example, cluttered desk with catalogs, papers, receipts, etc. Select a small area, it is least painful. Put the waste paper basket next to you and throw out any print material that is older than 1 month. If you haven’t read it by now, it probably not going to happen. If it kills you to throw books or magazines out, give them away to libraries, Salvation Army, or waiting rooms at clinics or hospital. Use envelops or manila folders for tax or credit care receipts. If necessary, keep files in rack organizers on your desk. How frustrating to stack a file among other papers, only to not have it at a team or board meeting. Consider a cork or bulletin board to tack up tickets or registrations for upcoming events. It so disconcerting to be rushing around looking for tickets, just before you are supposed to leave for an event. Consider creating digital files for mail, papers, and receipts. Even the least technologically gifted can learn to do this. Somehow, they don’t lose the phone, but do misplace papers. Perhaps begin by archiving travel reservations or meeting notes. Establish the easiest simplest routine to keep up with the clutter. 5 minutes at the end or beginning of the day. Set an alarm to remind you. Work with a buddy. Use the phone or Skype to keep each other company as you clear out the “stuff” that has accumulated over the past months. In the places and spaces where you work, even the small attempts at spring-cleaning will help your mood, motivation, and productivity.